If you're doing business in real estate, one of the greatest skills you can acquire is the ability to create compelling property listings that sell properties quickly. In my experience, most properties are quite capable of selling themselves, but ONLY IF you've priced it right, promoted it adequately and created a listing that clearly communicates why your property is the deal of a lifetime (i.e. – why your buyers would be absolutely crazy not to take advantage of the opportunity). If you want to learn how to write real estate ads well, the fact of the matter is you don't need to look like everyone else. In fact… looking like everyone else is one of the worst things you can do. If you create listings that blend in with the crowd, people will ignore you. Looking “average” is one of the best ways to be forgettable and NOT get noticed by the masses. That being said, I'll be the first to tell you that it isn't easy to think outside the box and be original! It's not naturally intuitive for most of us to be different/creative and that's why so many listings are so boring and uninspiring. Don't get me wrong, some of the well-established tactics out there do work, but most people aren't clear on which tactics work and why. In order for me to show you how to write listings well, we need to hit the “Reset” button and start from square one. 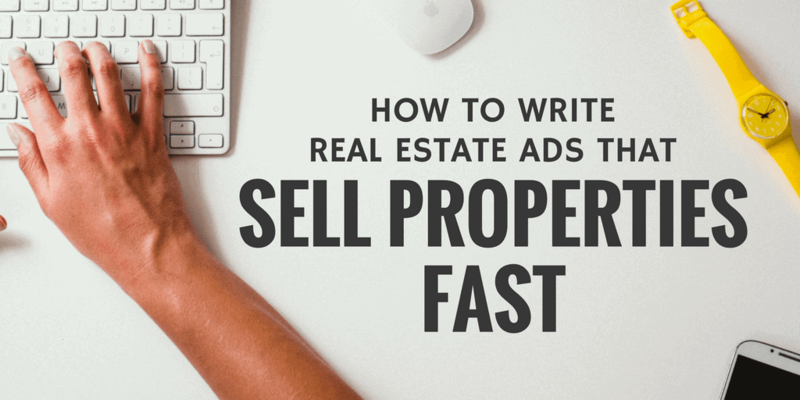 When you're posting your property for sale on a website with thousands of other listings, it is imperative that your ad has an eye-catching headline that looks different. Your headline is an extremely important part of your listing because in most cases, this will be your only shot at getting a buyer to notice you, so you’d better find a way to stand out from the crowd. Remember, you only have a split second to catch someone’s attention and engage them in clicking on your listing – so this kind of first impression is EVERYTHING… I'm not kidding! Does it stand out from the other headlines around it? As you can see, it's not rocket science. You just have to use your brain for a few extra seconds. Try to be just obnoxious enough to get noticed. You don't need to lie. You don't need to exaggerate. You don't need to price it at 50% of market value. 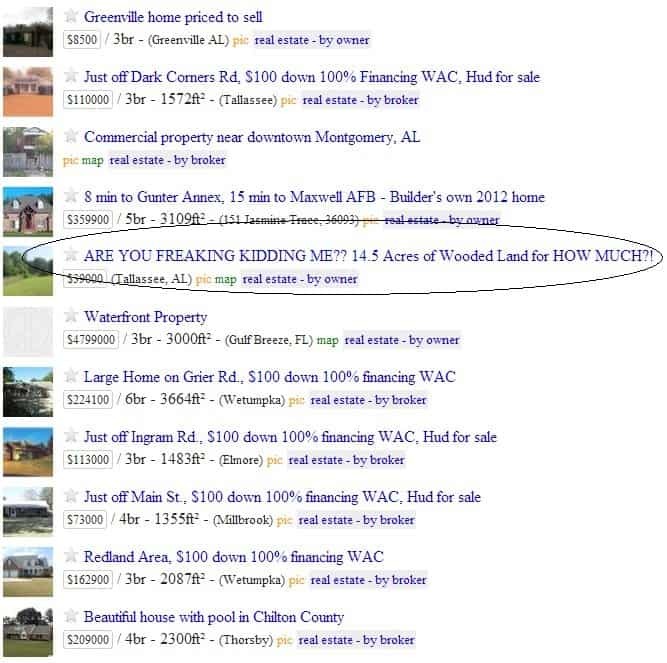 You just need to get people's attention and give them a reason to click on your listing (even if it's out of sheer curiosity). Note: It obviously doesn't hurt to include a picture (which will be displayed as a thumbnail) and a good price point to go along with your headline. You'll love this gorgeous 2-story home located just 3 blocks from Parkside Elementary in downtown Coopersville. Come see this charming ranch with an open floor plan and breathtaking panoramic views of Cedar Springs! As you can see – we're simply answering the reader's most pressing initial question (i.e. – “What am I looking at?”) and to giving them a reason to keep reading. Extras, e.g. – Pool, Patio, Yard, Deck, Fireplace, etc. new furnace, air conditioning unit. all appliances includes. Huge deck off back of home. walk out in basement to back yard which is fenced in. Lots of updates done. 1 stall attached garage with finished breezeway. You’ll love this charming, 2-story cottage with spectacular panoramic views of Otter Lake. This 3 bedroom, 2 bathroom home with a 2-stall garage will give you 1,700 sq ft of generous space to move about (without losing that quaint, cozy atmosphere when it's time to cuddle up by the fireplace with a good book). Wake up each morning to awe-inspiring sunrises in the East and drift off to sleep each night with the tranquil sounds of nature. Situated in a friendly community with an award-winning school system on the outskirts of Allegan County, just thirty minutes from the magnificent City of Grand Ledge. As you can probably see – these two examples are not created equal. It takes real effort to be creative and think of descriptive words that will actually make your property sound appealing. Most people don't have the patience (or they just don't care enough) to go the extra mile in this area, but putting forth this extra effort can make a HUGE difference in the way buyers perceive your property. Some people will find that they excel in the area of “creative writing” pretty naturally. Others will find that it's a major struggle. Not everyone is gifted with the same ability to find words that create amazing mental imagery like this… so if you fall into this camp, don't worry. 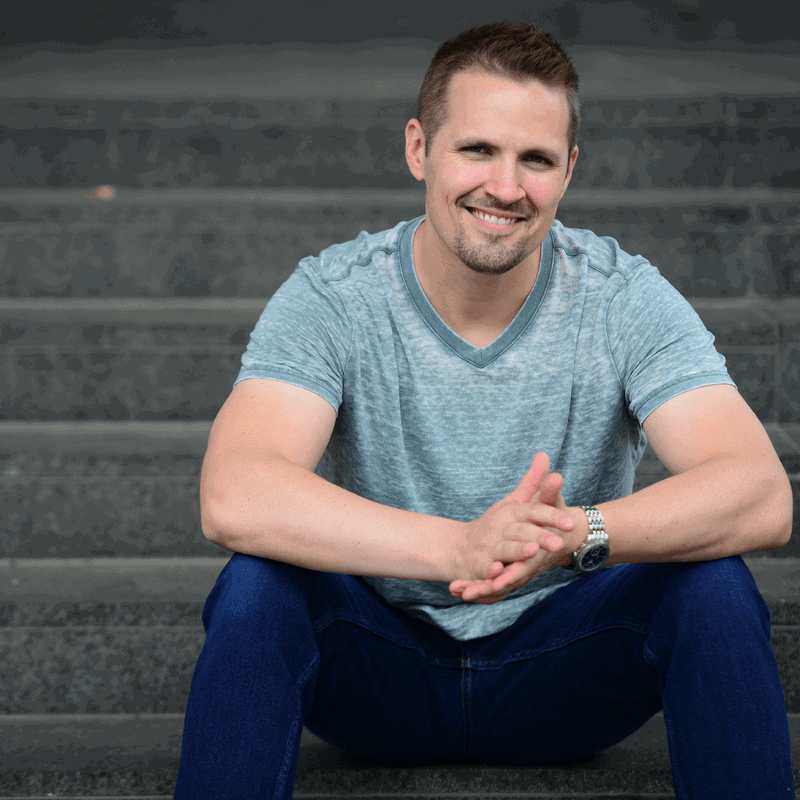 At the bottom of this blog post, you'll have a chance to get your hands on a TON of my marketing materials that will make this whole process a lot easier for you… so keep reading. Please note that this property is also available to purchase with optional Seller Financing. For a small down payment and monthly installments, you can own this property WITHOUT talking to a bank! This is where you wrap it up and tell your readers what to do. Don't be afraid to ratchet up the sense of urgency and remind them of the very real possibility that this is the last chance they'll ever have to buy this property. There is a fine line between painting a positive word picture about your property and overselling/hyping your property. I know – I'm telling you to show off how great your property is and it can be tempting to overstate the “greatness” of it. The fact is, most people know B.S. when they see it. If you come blasting out of the gate with claims about your property that are clearly embellished or just outright false, you're not going to fool anyone. At best, you'll seriously tarnish your reputation in your market and you might even create some new enemies along the way – so don't go there. The trick to selling is not to “trick” anyone. The goal is to be very clear about why your property is an amazing opportunity and if it's communicated the right way (and if your asking price is in-line), you can help a lot of people “connect-the-dots” and realize that your property is exactly what they need. 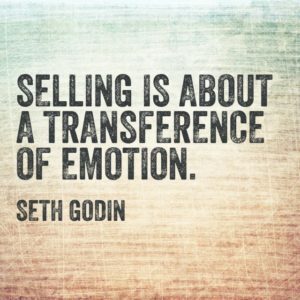 The most successful salespeople know how to convey this information seamlessly and effectively, all while catering to the emotional needs of their buyers. Don't oversell it. Don't make it into something it's not. Just describe your property and it's featured in a way that will help buyers see the greatness of it. Help them to picture themselves in your property and come to the conclusion that it's the best decision they can make. Want To See The Exact Listings I Use? As I explained above – I have no doubt that you are FULLY CAPABLE of creating your own listings that will make your properties get noticed and sound amazing. I've tried to outline my process for you above (and include some small excerpts throughout) so you can get a feel for how I approach this. I completely understand that we weren't all born with the “creative gene” to effortlessly whip up these kinds of listings in 60 seconds. While we're all capable, this kind of thing doesn't always come easy (and some of us just don't care enough to go the extra mile here). I get it – I really do. With this in mind, I've taken the time to put together a fast and easy solution for those of you who need ideas & inspiration that you can easily implement into your own listings. Again, there's nothing particularly “magical” about these resources or the words I use. I've just invested a lot of time and energy into creating listings that blow my competition out of the water and I want YOU to do the same thing. If you think this kind of material would be helpful as you're creating your future property listings – I want to make this FULL package available to you right here, right now. 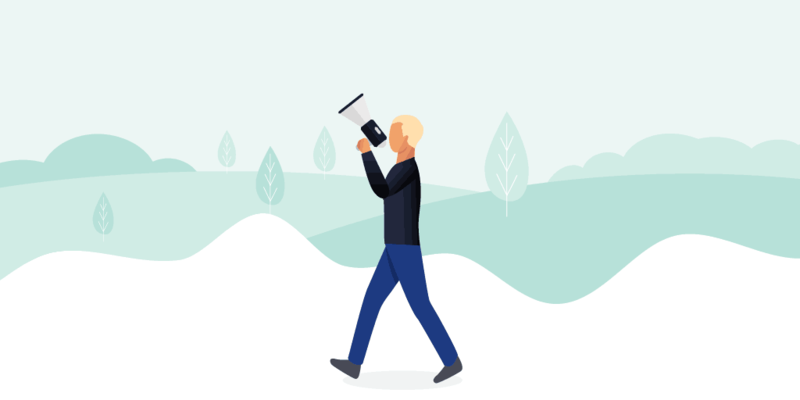 This little arsenal of proven ad copy has the power to transform your real estate ads and give your sales efforts a MAJOR boost over the long haul. If you're serious about getting properties sold sooner rather than later – I'd encourage you to make this small investment (which is easily worth 50x the price tag shown below – no exaggeration). Feel free to copy or edit each sample listing to fit your needs, or just use it as inspiration to create your own masterpieces. Note: When you sign up as an REtipster Email Subscriber, I'll give you instant access to this item (along with a truckload of other cool stuff) for FREE. For over a decade, I've used these ad writing techniques to drive some serious sales and revenue to my land investing business. Land is a massive opportunity that most investors aren't paying attention to – and for the few land investors who know how to pursue this business with the right acquisition strategy, it's an extremely lucrative way to build wealth and financial freedom with real estate. I'm totally serious! Join today and you'll be glad you did! Great article and really helpful. I tweeted this and I’d love to get the package you put together. Hi Virginia, thanks for your feedback! I’ll send you the materials shortly. Hi Seth, I work with many agents in different offices and this is something that many agents wonder about, how to get their listing noticed. You have pulled together so many great examples above, would love to get the rest of the information. Here is a link to a video that was produced by Sage Real Estate in Toronto. Definitely fits the bill for thinking outside the box when it comes to online video marketing . Hey Michelle! Thanks so much for sharing your thoughts on this. It sounds like this post was pretty relevant to the agents you work with, which is awesome! I’ll send you the materials shortly. Those are some awesome videos! Thanks for sharing. Nicely done and well said, Seth! I’d also love to get the package you’ve put together! No problem, thanks for checking it out Neil! VERY good info! C/p for the next time I List a property (SHOULD be tomorrow afternoon). Also, Tweeted & would appreciate the List you mentioned. Thanks Travis, glad you found it helpful! Check you inbox – the materials have been emailed to you. I love your article. I tweet it and im following you now on Twitter. I would love to be one of the 15 that will get the package. Thanks Hector! I appreciate the Tweet. 🙂 I will be sending you the package in the next 60 seconds. Hi, I really enjoyed reading your article. I would love to get the package, it would really help me with my work. Hi Ily – all you have to do is sign up for the REtipster Club and you’ll get free access to it. You can find the sign up box above, right at the bottom of this blog post. Please send me the material thank you so much in advance. Hi Amit – did you sign up for the email list? That’s all you have to do in order to get access. If you already did and you didn’t get the automatic “Welcome” email – let me know and I’ll send it to you manually. Great article. I gave you a tweet and a Google . Could I get a copy of the package, also? Much appreciated George – thanks for stopping by and tweeting this blog post for me! I’ll send you the package in just a few minutes. Keep an eye out for it! Are you sending any more packages? I would certainly like to have one since the info would be very helpful. Hi Cecile – thanks for the comment, you’re not too late! I’ll send it to you shortly. Thanks for the suggestions Moses. I’ve looked up both and they look like awesome resources for selling! Hi…I am reading your articles. Thanks for sharing this informative post. I LOVE this article! Is it too late to post on Twitter and still get the package? I’d love to have it, this article has already been so helpful, I’d like to see what the package has. Hi Ethel – thanks, I’m glad you like it! All you need to do is sign up for my email list and I’ll send you a link where you can download the entire package for free. Hey Seth! I’m not an agent, but a homeowner frustrated with my areas local lazy agents. An agent set the price (we went for their middle of the road price) but nobody ever showed it. So we are firing our agent. Can I get a free packet to help me sell my own home? Hi Mary, absolutely! All you need to do is sign up for the email list and you’ll get a link where you can download the whole thing for free. Seth, A very well thought out and written article for Agents to Promote their listings. I’m surprised that most listings follow the same dry format. Taking more time to write like a “copywriter” or following your structure, for their listing would get more attention. Hi Chuck – thanks for sharing! I’m curious what kind of interest rate are you charging for only 5% down? That sounds like a pretty sweet deal for those who don’t want to tie up cash. In terms of how to use the same writing technique for your product – you could really apply the same kinds of strategies. How can you catch a reader’s attention in a world of bland & boring headlines? What kinds of funny or obnoxious pictures would be impossible to ignore? Any good videos you could put together? Hi Jonathan, absolutely! All you need to do is sign up for the REtipster Club (my email newsletter). You’ll get an automated email with a link where you can download the whole thing for free. Clients Homes front and Center! Thanks so much for the kind feedback Grace – I’m glad you found this stuff helpful! EXCELLENT INFORMATION ON HOW TO LIST MY PROPERTIES, I WILL BE AT WATCH ,FOR NEW TIPS HURRY UP OK!! Wow! This was a great article. Love the promotion ideas. I am going to share this with my FSBO sellers. That’s awesome! Thanks for the thumbs up Jake! Nice informative article. Some of the suggested solutions for the issues will be useful for me and other real estate members. Interesting post! When I first started my online adventure in real estate I started blogging about how to increase customer. great! Great tips and suggestions! Thank you. Writing great ads is a very strong trait of a successful investor, I very much agree. Thanks for your great tips! Glad to hear it Eissej! Wow. That’s the best article I have come across so far. Thanx so much . Looking forward to the special offer. Thanks Dave, I’m really glad you found it helpful! I found your article very helpful. I am a new agent and would love to have access to your Headlines and Listing Pack. Thank you so much for sharing. Hi Christina, thanks for your comment! All you need to do is sign up for my email list above and you’ll get access to it for free. If you have any questions about how to get signed up, just let me know. I’d love to have the headlines packet for signing up. Thanks! Hi Kasey, if you signed up, you should’ve gotten an email with a link to the “top secret” page that contains this free download. Did you get that email from me? Thanks! Looking forward to the tips! Awesome information that will help me sell a house that I have on the market for more than two months but no offers yet. I appreciate if you can send me the package with listing tips, adjectives for free. Hi Sergio – sure thing. All you need to do is sign up for the REtipster Club email list (see the opt-in box above). Once you sign up, you’ll get an email with a link to a page where you can download this package for free. Thanks! Nicely documentated and well said, Seth!,…i have shared the link in my facebook account I’d also love to get the package you’ve put together thanks!! Thanks Walter! Have you signed up for my email list (i.e. – the “REtipster Club”)? There’s an opt-in box above, and in the right sidebar of the site. Once you do, you’ll get an email link to the “REtipster Toolbox”. Once you get to that VIP page, you’ll be able to download this item for free (along with a bunch of other cool stuff). Im mailing from South Africa .. came accross your blog/website and would love to see the rest of the package you have created? Hey Mandy! Thanks for stopping by. Have you signed up for the email list yet? When you do, you should get an automated email with a link to a hidden page where you can download this package for free. If you’ve already subscribed and haven’t seen that email come through yet, let me know and I’ll send it to you manually. Great article! Words do have power. I am a copywriter in the real estate niche. I love how you instruct agents to be different and honest. You only need one buyer for each house- but it has to be the right buyer. Using descriptive, honest words saves everyone time and brings the seller more money!!! Thanks for stopping by Heather, and thanks for your comment! It’s great to hear from someone like yourself who know just how powerful the right words can be. Thanks again for sharing your thoughts! Hi Seth. I have a very old house that Im trying to sell. Im wondering if you can look at my situation and just give me some advise. Please Please…!!! Thank you. Hi Michelle, what’s your situation? What sorts of questions do you have? Thanks Seth for the wonderful idea, with the help of this now I think I am able to sell my aunt’s house and also like to share your idea in my friends circle. You implied in the video that I watched (before visiting this site) that your 30 attention grabbing headlines and other text was free on this blog. Thanks for the info about postlets, but I’m disappointed to see the marketing text costs $30.00. Thanks Kim, it actually is free! All you have to do is sign up for my email list (see the opt-in box above) and you’ll get access to this item for free. Sorry for any confusion! First I tell you how I found this article? I was searching an article that could help me in writing a great sales copy. Here I found everything what I was looking for. Thanks for this useful article. It resolved my each query….Now I got confidence to write an effective classified for my new client. That’s so awesome Nikhil! Thanks so much for letting me know how you found the blog post! 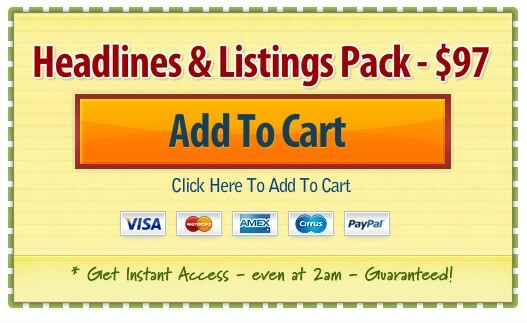 Will the Headlines & Listings package work for marketing wholesale deals to cash buyers/investors? I have been getting deals, but finding the buyers quickly has been a challenge. Hi Rhonda, I would say so – it’s worked for me! Hi Seth, I am also a new Agent and I Just took my R.E. test yesterday. I have been practicing writing ads but they all sounded generic. I am not a terrible writer, but I found my ads boring and they are not getting much attention (actually haven’t got any response to any yet). I decided I need help. When I read this very informative website created by you, It was like finding treasure! You are a great person for sharing this info. Your the best Seth Williams!!! 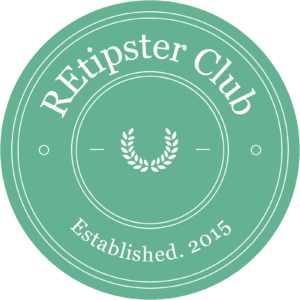 I will sign up for RE-Tipster and I am looking forward to reading the material you have provided right a way! Thanks so much for the kind words Adam, that’s awesome! I’m so glad you’re finding this stuff helpful. I know what you mean, it’s not always easy to think with our creative sides – sometimes it just takes a little bit of inspiration and example to kick this part of our brains into high gear. Hi Anthony, this isn’t an “app” per se, it’s just a format for writing property listings (and it works pretty well when you follow it to a T). If you applied it to your own listings, I’m sure you’d see a positive effect. Does this answer your question at all? I am a real estate newbie..and I want to stick out from the crowd. I would love your package. Hi Wendy, all you have to do is sign up for the email list and you’ll get instant access to it! Hi Seth, we are finding that realtors in our area don’t seen to have the same vision as we do. My husband and I rehab and resell. We are desperately trying to get the RE’s to understand that verbiage is everything. I feel your program will be beneficial to our style of listing. I also want to make “Sales Flyers” to place around town, and copies in each property for potential buyers to take with them sop this home will not be out of sight, out of mind. Do I go the PayPal to order immediately? Thanks for your purchase! I’m glad this stuff is resonating with you. Great tips! Sometimes I think it’s also a good idea to contact print companies to have them design signs and other advertising tools. Professionals can help you save a lot of time and money sometimes! Not a bad idea. Thanks for sharing your thoughts! this is a great deal of ideas, Seth. I have learnt quite a bit from what you shared here. Awesome work, keep it up. I would like to get that package if it’s not too late. I’ve bookmarked your site. I’m subscribing to your list. Thanks again Seth. Thanks Charlie! If you’ve subscribed to the email list, you should get an email where you can go and download this item for free. If you need me to send you the link again, just let me know. I adore your ideas but how would you write a leaflet to mail through someone’s door of a house that you really wanted to buy ? Hi Pippa, I honestly haven’t ever tried that particular approach, but I have tried working with neighbors to buy and/or sell their properties (to combine then with my properties). You can check out how I do that right here. Thank you so much for this wonderful article. This is simply great and really helpful. I am owe a small real estate business in India and I am always keen to learn more things from selling prospective. I have already shared this article with my team. I would surely start following the practise suggested by you and market my properties according. Again I would like to thank you for posting this wonderful article. Hi Mayur – thanks so much for the kind words, and thank you for sharing this article with your team! I’m honored that I was able to help you! I think that the most important thing is where you choose to put the listing. You need to use all the available marketing tools, especially the online ones. I agree. Thanks for sharing your thoughts Oliver! Hi Robb – it is! You can get it right at the bottom of this blog post (see above), or if you want to sign up for the email list, you’ll get access to this item (and several others) for free. Thank you for the great advice! I have been industry for several years and knew that my descriptions were uninspiring but did not know how to jazz them up! I am glad to have found you online. That’s awesome! I’m glad you found the information helpful Toni! Great article… Please send the package and sign me up for the newsletter!! Thanks!! Hi Vicki, it looks like you’re on the list (which means you should have gotten a link to the subscriber toolbox page). If you still need help (i.e. – if you never got the link), let me know! Hi Annie, all you need to do is sign up for the email list and you’ll get a link to the REtipster Toolbox, where you can download it for free. Thanks! Descriptions are so important that there are even professional copywriting services that will write the description for you. I believe it! A great description can go a LONG way. Your wisdom is greatly appreciated as I sit here writing my first listing marketing remarks. Thanks for sharing the info. God bless you! Thanks Denise – I’m glad to hear it helped! I do ad writing but have no experience in real estate ads. However I see that with a little work, the ROI for investing in ad writing could be massive. If you have a minute pls check out my site and get back to me if you see room to use this software for customizing real estate ad swipes. Hi Jesse – just checked out your site. I think there would TOTALLY be a demand for that kind of software if it’s tailored specifically to real estate (I’d buy it in a heartbeat). I think the product might take a bit of refining to “pretty it up” and make it idiot-proof for all potential users, but there is definitely some value there. If you need any test-user feedback, I’d be happy to help! Great. Please contact me at the email I used here and I will send you the info…I’d like to chat. People see through that stuff really fast these days don’t they. TOTALLY agree Jason. People definitely aren’t stupid – and it always amazes me how many sales people don’t seem to understand this. Your information is practical, positive, and helpful. I’m an agent trying to sell my own home, I agree that writing an attention-getting description is key. I’m also trying to figure out how to reach my market besides listing it on the MLS. Thank you for your creative and thoughtful post, Seth! Thanks Anne! One other way might be to list the property on Craigslist and/or ForSaleByOwner.com – those sites seem to operate on a different wavelength than the MLS, and different buyers tend to shop on those sites. Best of luck! I purchased your ads and the copy is great. I noticed that overall they were shorter than many ads, offered some but not a lot of details, and none of them included the price. This isn’t a critique at all…Im really curious what is the reasoning? Do you add more details? Price? Finance Terms and/or options? Or just leave it vague on purpose? I’m writing my first ads and am really curious! Hey Roman, thanks for your feedback! I think the length of the description depends partially on the property itself, and how much there is to explain. Some properties probably do warrant more depth than others (for example, a 20,000 square foot home could easily be MUCH longer than an ad for a 1 acre vacant lot). I typically offer financing as an option with properties I sell, but give people more of an incentive to pay cash (just because I prefer to get all of my cash at closing rather than over the course of 3 – 10 years). The primary goal is to make the property sound as awesome as it is, and to help the buyer’s dreams come alive (because for most real estate transactions, the decision to purchase has everything to do with a person’s emotions). Thanks for sharing Simon! Sounds like a great resource. Hi Seth, was reading your post above was helpful. I work in the Middle East, Dubai as a Real Estate Agent. We have apartment blocks where there is the same units throughout a project of 20 buildings. Is there any advice you can give on how best to make something that is all the same and listed with every agent in the market (very little exclusive sellers) sound different and attract more call ins. check out the website that is very popular in Dubai http://www.Propertyfinder.ae you will notice that most of the listings are fairly dull. Any advice would be well received. Hi James – wow, that’s a great question. I encounter this all the time, and I know what you mean… sometimes it’s a challenge to make YOUR listing look more compelling when every other (similar/identical) listing in your market is basically offering the same thing. Even though the product may be similar, there’s no reason you can’t make your listing look WAY better than all the other boring, monotonous ones in your market. You could also consider posting your ad in more places (outlets where you competition isn’t present). There’s actually a lot more you can do, which I explain more in this blog post – be sure to check it out! I’m a newbie in this real estate industry and trying to read more on how to be an effective e-marketer. I’m doing this job for about a month and I’m using trial and error what are the things that can capture the interest of my prospect. This is my first time to see actually an example on how to be different from the usual advertising or listing. I will use the knowledge I got from here. Hope I can be great as you are. Thanks for your comment Alie! Writing great listings takes a little bit of creative energy, but it’s not as hard as you might think. Use your imagination and you might be surprised at what happens! This one os really a good post with a lot of useful stuff about the topic buddy. I just wrote one after reading this. Helped me write better. Thanks a ton! That’s great to hear! Thanks for sharing Symdo! Hi Seth, great read on your article. I am new to the real estate industry, I have been developing my own style of writing when it comes to placing ads online. I started off by looking at descriptions of published ads but according to your article you mention that its a dead end. I would like to start from square one as you suggested so I can learn what tactics work and why along with your marketing materials. What advice do you have for me given the circumstance, also is your package still available? Thanks for your time in advance. Hi Laura – thanks for sharing your thoughts (and yes, the Headlines & Listings Pack is still available)! I think it can help to read other published ads, but only to the extent that those published ads are GOOD and move readers to action (and as you’ll probably see, most listings are not that well written). I think the important thing is to use your own creativity along with powerful action words and language has has been proven to get results. If you put enough time and thought into your listings, you can create something very compelling. Hi Seth, great read on your article. I am new to the real estate industry, I have been developing my own style of writing when it comes to placing ads online. I started off by looking at descriptions of published ads but according to your article you mention that it’s a dead end. I would like to start from square one as you suggested so I can learn what tactics work and why along with your marketing materials. What advice do you have for me given the circumstance, also is your package still available? Thanks for your time in advance. Thanks Kadhal – glad you enjoyed it! Once again great article I would like to get my hands on this package I have signed up for the REtipster Club. Hi Victor, I just sent you an email regarding this. It’s been great such articles.I really appreciate it.The content you have written in your blog is valuable.As a Real Estate Agent, you might not think of yourself as a “sales person”, but in fact that’s exactly what you are. You sell properties, normally through your persuasive ability to talk to potential buyers and convince them that your listing is just what they’re looking for. As well as having great inter-personal skills, a Real Estate agent needs to be able to write a listing that clearly communicates why your property is the deal of a lifetime and can’t be missed!The quality of your ads reflects the quality of the listing and the quality of your service. Hi George – thanks for stopping by! If you sign up for my email list, you can get access to this package for free – just submit your email address and you’ll get an automated email with a link to a top secret page where you can download it. Hope it helps! To increase the chances that a buyer will fall in love at first sight with your property, you’ll need to impress them with a good first impression. And that could be achieved not only by great description, but also with high-quality photos which you attach to your listing. You may choose to hire a professional photographer to help you take the most effective photographs, but it’s also possible to do it yourself. Here https://rentberry.com/blog/real-estate-photography-tips recommendations from photography professionals who’ll give you great beginner advice on taking photos that sell homes. Thanks for being so willing to share, I’d love to read more. Sure thing Heidi – thanks for reading! Hey Lynette – seriously?! That’s crazy! I live just around the corner from Belmont. Feel free to reach out to me through my contact page. I’d be happy to meet up any time! Thanks for this content help us a lot. Kepp it up! I ABSOLUTELY loved this!!! I work with 20 agents and this would make mine and their lives so much easier! I would love to see the package – thank you so much for doing this! Thanks for letting me know Melody, I’m glad it was helpful! I’m new to this game of script writing for an agent …well newish as I’m on my 6th script now….I always get stuck on the opening lines …any advice…. Thank you so much for this awesome article! I just got my real estate license and my aunt is selling her house thru me….and this article is just perfect!! However, I’ve tried several times to subscribe but I have not gotten any email, inbox or spam. Thanks in advance!! I will buy more of your helpful info or do a mentoring. I think you are one of the more knowledgeable, sincere and generous expert on the internet. Would be selfish of Me not to comment and just walk away. I’m actually a newbie in the estate business but in Africa , Nigeria to be precise and I really learnt a lot reading this. Thanks so much. Please email me your handle either Facebook or Instagram so I can follow you. Thanks. Hey Kingsley! Thanks for checking it out. You can see all of my social media handles by clicking on the appropriate buttons over on the right sidebar of the blog. Hopefully I’ll see you there! Good information and really helpful to me, can i get the package please! You bet Stanley! All you need to do is sign up for the email list and you’ll get access to it through the “REtipster Toolbox” (a secret page I only share with subscribers). Did you sign up yet? Wow! This was a great article. Thanks For sharing. I looked at your posts and i love them. Please can you share the package with me. All you have to do is sign up for the email list and you can get free access to it Abdulmalik! Best of luck! I love this article! Thank you so much for sharing. I would love to learn more. Thanks for reading Chai! I’m glad to hear you loved it! This is really helpful ideas and hints when writing up a new advertisement for a new listing. Magazines and newspapers to promote their properties and through real estate ads, You may find what you are looking for. Thanks for sharing. Thanks for a great article with so many helpful tips. Getting ready to sell my home now..
Sold one 3 months ago in 12 hours. Moved to FL and now putting this one on MLS next week. Good luck Rachelle! You can do it! To Be Auctioned – Foreclosure – Auction date to be announced – Holly Beach Subdivision – Waterfront Community – Plankatank River – 12381 Beech Trl., Gloucester, Va. House with three lots. Tax Appraisal $145,700 – Starting/Reserve Bid $87,000.00 – Call 276.285.0516 for more information. (a searchable website that allows one free listing). Video is also very good. Thank you for sharing the post. Great article and information. I do have a question. Is there a general length limit of the For Sale ad, or can it be a little lengthy to include all the great points of the home? Thanks! Hi Donnice – I think it just depends on which platform you’re advertising on (similar limits will apply to other things like the # of photos). To make sure it’s fully pliable, you could always create a long and a short version (but don’t make it unnecessarily long – if it’s not actually delivering much value or information, nobody is going to read it anyway). I like that you included the importance of well read and organized structure in your listing. This is the first step in selling your home fast. If you are inexperienced you may want some professional help. Seth Williams’ guide was well made and has great tips. It is really a good blog for the people struggling on selling their house fast. Seth Williams’ guide was well made and has great tips. It is really a good blog for the people struggling on selling their house fast.Thanks! Thanks for sharing your thoughts Alan! Including a picture of the listing with a thumbnail should be a standard that you have! This gives the reader an even great idea of what they’re looking at. And, I love that you said that you don’t have to exaggerate or lie. Knowing how to present a listing in an honest manner really shows! Very helpful post for writing an eye-catching ad. Thanks, Seth. I like how you suggested finding a realtor who you can trust. It makes sense to select an agent who is interested in you and not just a final sale price. My sister and her growing family have been considering selling their home and purchasing a larger one. Choosing a realtor that she can rely on could be beneficial to her, and make the moving process smoother. This is an amazing article. I am definitely going to add these points to my practice. Thanks alot ! Hope to see more like this. Great information! This is really helpful. Thanks for sharing. I will book mark your website and keep checking for new information about once in a while. I can see the benefit of having an eye-catching headline that stand out from the crowd. Would you have any tips relating to coming up with good headliners? Also, would you recommend even mentioning about the negatives, if not asked? Hi Ville – coming up with good headlines is an art and a science. One way to get some good ideas is to simply pay attention to what kinds of headlines catch your attention (whether they’re on a magazine rack, the newspaper, or on Craigslist). There’s usually a reason why they’re catching your eye, and they’ll tend to catch A LOT of other eyes too. If you can figure out what elements go into those effective headlines and reverse-engineer them into your copy, it can be pretty powerful! Hey Mr. Williams, just wanted to drop you a line and thank you for writing this very detailed post! When you touched on talking about the primary features of the property and the way to describe properties in a compelling/inspiring way made me completely adjust my whole approach when dealing with clients. Great read, shared it on my social pages, take care! Thanks for the kind words! I’m glad you enjoyed it! Hi Seth, Nice work. I would love to have the package. Thank you so much.